Michelle Terrell is a mother of five who moved from the East Coast to Mill Valley six years ago. Her kids wanted to learn how to surf when they got here, so she enrolled them in a surf camp. “And I would say half-joking when they got back from surf camp, ‘I’m glad a shark didn’t eat you today,’ ” says Terrell. 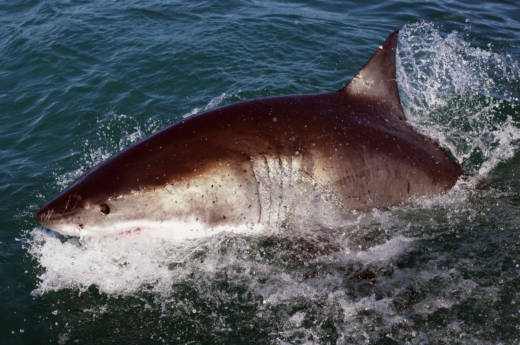 Do swimmers and surfers really have to be afraid of sharks when going out into the bay? You are not much at risk of a shark attack in the waters off California. You’re much more likely to win an Oscar, be born with 11 toes or get hit by a car than be bitten by a shark. That said, the Pacific Ocean is home to loads of sharks. 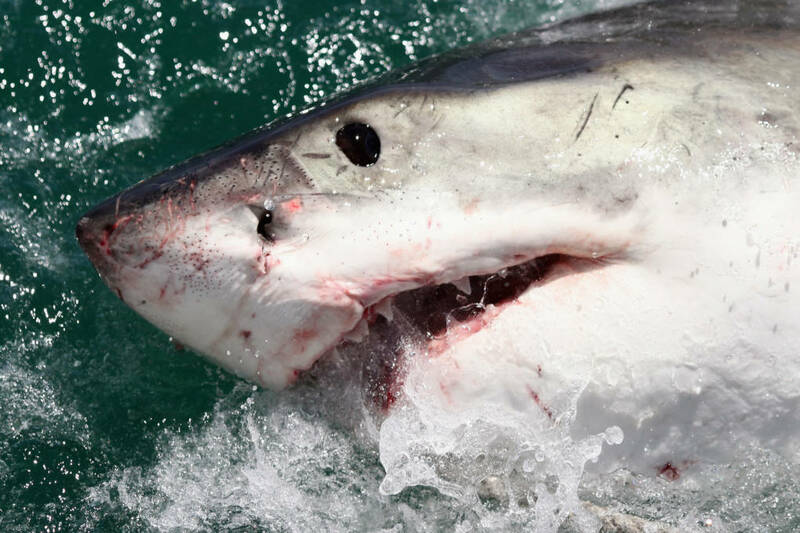 Including the shark we most fear — the great white shark. Juvenile white sharks can be found mostly in Southern California and are far less dangerous than their fully grown counterparts. “They are almost two different species,” says Salvador Jorgensen, a senior research scientist at Monterey Bay Aquarium. 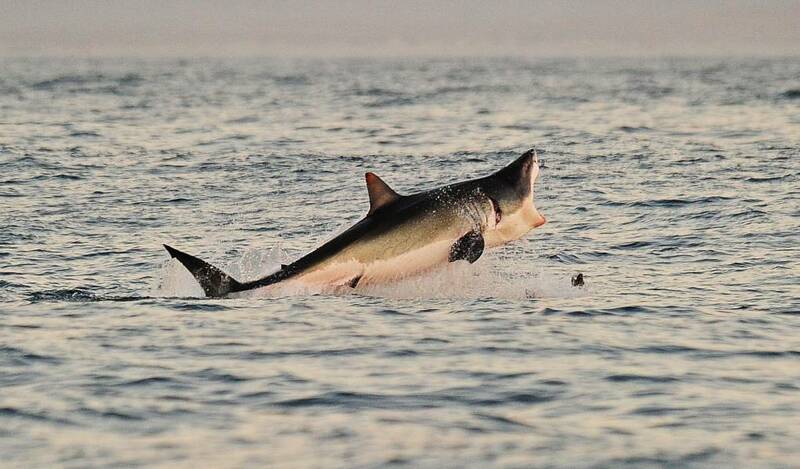 As the white sharks get bigger, they head north to where they can find larger, fat-packed prey — seals. There’s a high concentration of elephant seals and other pinnipeds in a stretch of coastline between Northern and Central California. It starts in Bodega Bay, extends out to the Farallon Islands and ends around Monterey Bay. “This is the area with the highest concentration of white sharks in the northeastern Pacific probably,” Jorgensen says. This area is sometimes called the Red Triangle because, if you look on a map, it makes a triangle. “Supposedly it refers to all the blood in the water,” says Jorgensen. He means seal blood. But white sharks can often be found outside the red triangle. You can actually spot them all along the coast. 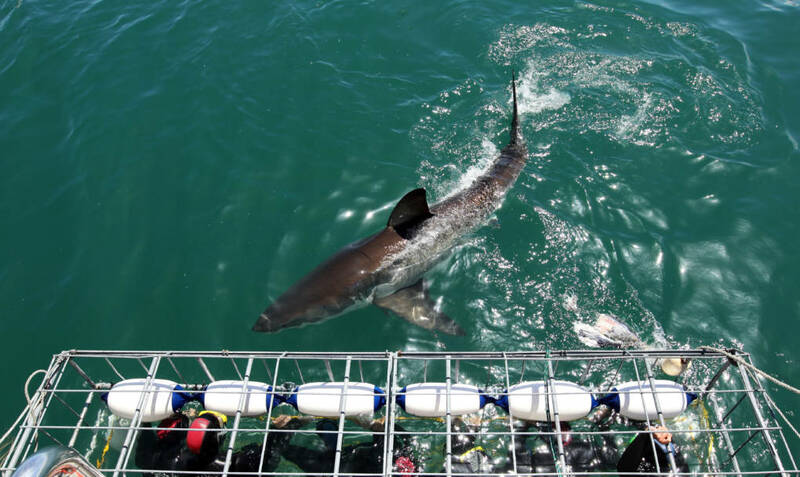 “Mendocino is also a major hot spot for white sharks,” says Francesco Ferretti, a marine ecologist at Hopkins Marine Station of Stanford University. But What Are My Chances, Really? Jorgensen and Ferretti have researched the actual risk of shark attack in California. They found that surfers have the most frequent shark encounters by raw numbers, followed by abalone divers, scuba divers and finally swimmers. However, if you control for the number of people doing these activities, abalone divers are most at risk. “Abalone divers are most at risk with a 1 in 1.44 million chance of being attacked. Surfers have a 1 in 17 million chance of a shark attack. People going to the beach, just swimming, have a one in 700 million chance to have a shark bite,” says Ferretti. Humans are not the preferred prey of sharks. Our stringy bodies are far less appetizing than a fat-packed seal, the chubby dumpling of the ocean. This might explain why sharks occasionally bite surfers, because from below, they kind of look like seals. To mitigate shark attacks, the Hawaiian government culled over 4,500 sharks between 1959 and 1976. But according to the Hawaii Institute of Marine Biology, the program was ineffective in reducing the number of shark attacks. Now some experts believe that governments can make the ocean safer by protecting the shark’s food source and ecosystem. “Sharks explore potential prey by biting it,” Ferretti says. “They bite otters as well. As they grow and learn about potential food sources, sometimes they make a mistake." To reduce your risk, you could surf outside the hot spots or avoid the water at certain times of year. To help remember riskier months, some use the term "Sharktober." When they aren’t in the Red Triangle, our great white sharks swim in the waters around Hawaii, or in an area halfway between here and Hawaii called the White Shark Cafe. Between 1950 and 2013, there was an average of 1.37 white shark attacks per year, with an increasing trend from .9 attacks per year in the 1950s to 1.5 attacks per year in the last decade of the study. In that time there were 13 recorded shark fatalities in California and only one near the San Francisco Bay. While the number of shark encounters in California has gone up, the risk has dropped about 90 percent between 1950 and 2013. The reduced risk could be a sign of a declining shark population. A number of “shark repellents” are now on the market. One wristband sends out electromagnetic signals meant to upset a shark's electromagnetic sense. Another repellent uses “extract of dead shark” to freak out sharks with the smell of their own dead. Jorgensen says it’s hard to run scientific studies on these repellents' efficacy. “It’s not super convincing, and in one case there was a controversy of whether that actually attracted the shark more or repelled it more,” he says. According to Ferretti, most sharks are killed through industrial fishing and the fin trade. At Hopkins Marine Station, Ferretti works in a lab where researchers are developing innovative tools to combat illegal fishing in the high seas. They’re looking into creating tags that would detect illegal fishing, and drones that could patrol the waters. The lab also studies movement patterns and the distribution of sharks throughout the ocean. They’ve been researching what shark populations looked like before industrial fishing killed millions. Lately they’ve also been looking at the importance of sharks in protected and thriving ecosystems.